THE Bauchi State chapter of the Christian Association has accused soldiers of killing worshippers after a suicide bombers attacked the Living Faith Church and Harvest Field Church on Sunday. CAN also disputed the casualty figure given by the police in last Sunday’s suicide bombing that occurred at Living Faith and Harvest field churches in Yelwa area of Bauchi metropolis. While the police put the casualty figure at 12, CAN said no fewer than 20 people died in the incident. He alleged that the police did not take into account the eight people who were shot by soldiers. The association also said 42 sustained injuries following the suicide bomb attack. Addressing a press conference in Bauchi on Monday, the state CAN chairman, Rev Lawi Pokti said, “Out of 20 people that were confirmed dead, 12 died as a result of bomb blast while eight were shot dead by the military who went to the blast site to maintain law and order. “Fourty five persons have been confirmed wounded out of which 25 were injured by bomb blast while 20 sustained various degrees of injuries from the gun shots from the military. He added, “As much as the Christian church appreciates the efforts of the Government in quick response to the site of the incident and the prompt attention given to the wounded by taken them to the teaching hospital for emergency help, we however condemn in strong terms the extra judicial killings. Women and children sustained various degrees of injuries from the military bullets. As far as a civilised world is concerned, we see this act as extra judicial killing and unfortunate worthy of all remorse by the Nigerian Army. Pokti said the security operatives had no moral and ethical justification to open fire on the women and youth, who came out to mourn their slain loved ones adding that, “the Nigerian Army should claim full responsibility and also compensate all the victims of this extra judicial killings,” he said. Meanwhile, the umbrella body of Muslims, Jama’atu Nasril Islam(I)and the Christian Association of Nigeria in the North, in Kaduna on Monday condemned the bomb blast on two Churches in Bauchi on Sunday which claimed 12 lives and the destruction of properties. 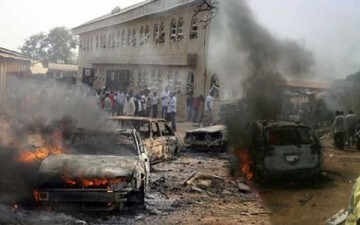 While the Northern CAN described the attacks on the Churches as barbaric, satanic,evil and unacceptable to Christians and any sound mind, the JNI in reaction to the incident said the attack on the two worship places was unacceptable, saying any attack on worship places was against the tenets of Islam. The Public Relations Officers of the Christian body, Mr. Sunday Oibe, in a statement commended the efforts of the Federal Government and security agencies at stamping out terrorism and in particular the Boko Haram insurgency in Nigeria.